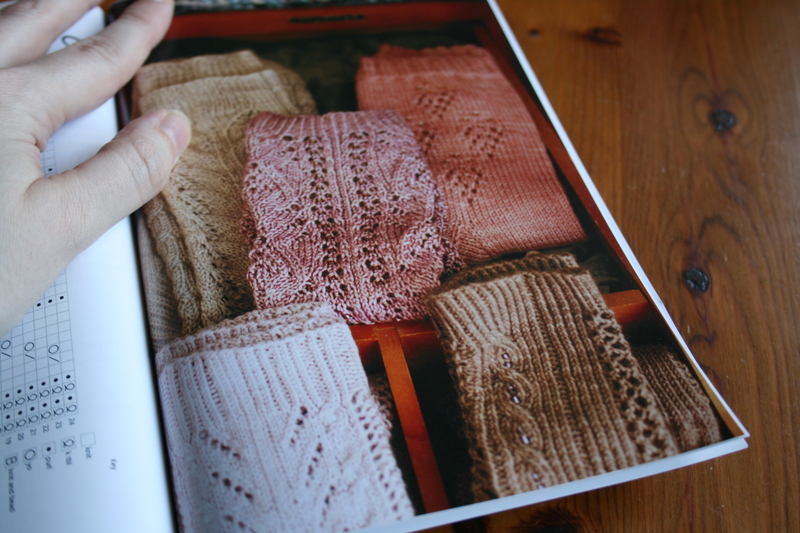 This is the start of a series of new monthly blog posts reviewing some of my favourite knitting books. 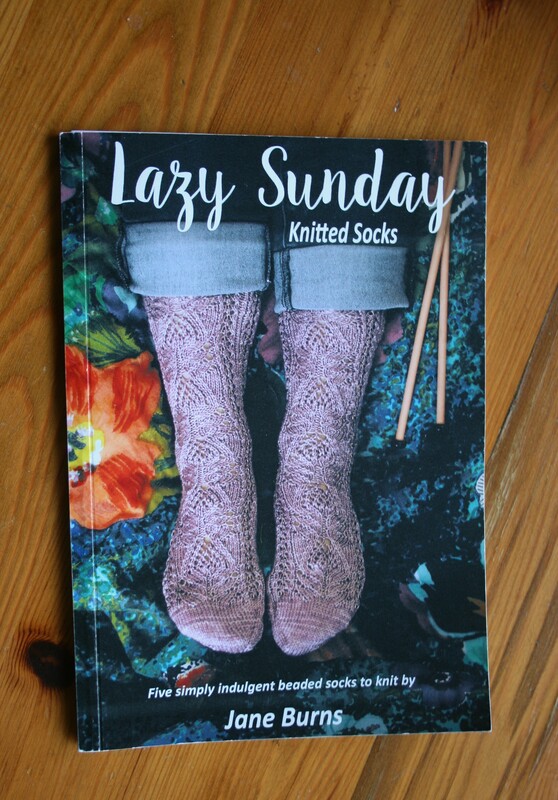 I’m going to begin by looking at Lazy Sunday Socks by Jane Burns. This is a book of five elegant beaded socks, all worked in Eden Cottage yarns. I hadn’t made beaded socks before but I like the concept of socks for lazing around in. So often we worry about how our socks will wear and hide them away in shoes and boots. 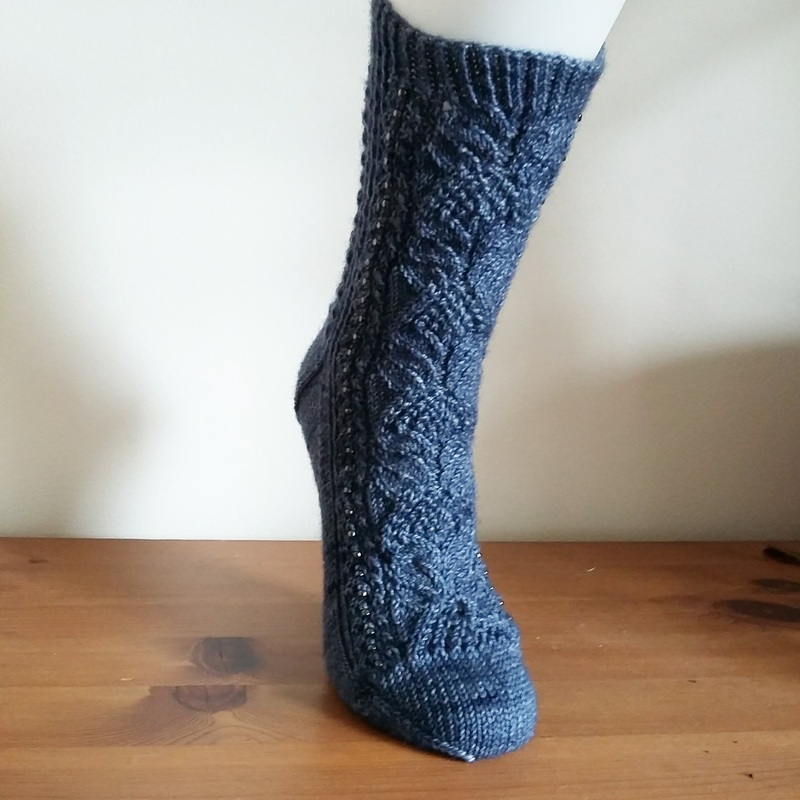 These socks are meant to be seen, and without the friction of rubbing against shoes and being walked around in all day they can use less practical but very pretty beaded designs and luxuriant yarn. The book is an A5 sized paperback which comes complete with a code for the digital version, which is always a bonus. I prefer to read paper books but, especially for travel knitting, having the digital copy can be really helpful. The five designs range in complexity – from Sitting in a Rainbow which is mainly stocking stitch with only 16 beads, No Room for Ravers which is simpler than it looks and up to No Mind to Worry. You could choose to make all of them without beads and still have lovely socks, but Jane Burns has placed the beads to accent the design very skillfully. All feature lace and some have cables too. 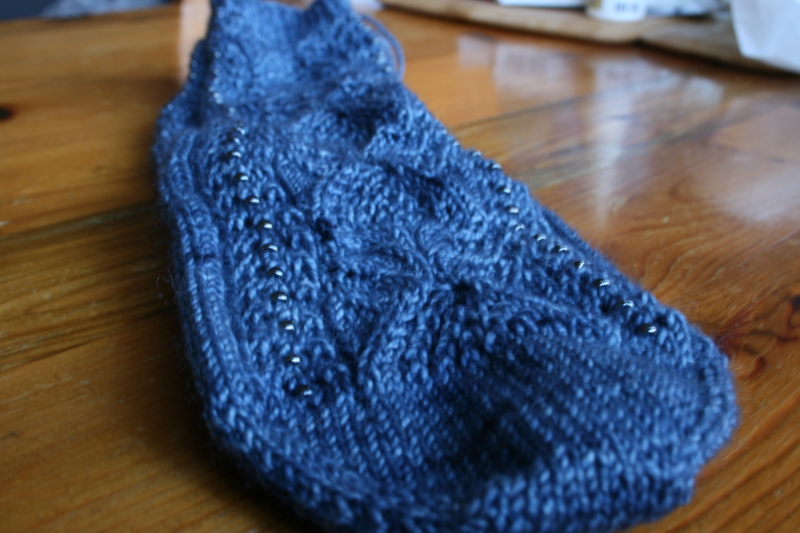 The patterns are all cuff down, with a flap and gusset heel, which is also my preferred construction. The patterns have very clear charts, but if you prefer written instructions this may not be the book for you. The socks come in at least four sizes and both the finished sock size, and the to fit size are included. I’ve been a fan of Eden Cottage yarns for a while. In fact, my Falling Petals Socks are made in their BFL Sock. Victoria makes beautiful muted colours in a range of bases, several of which are suitable for sock knitting. They complement the designs in Lazy Sunday Socks very well. Semi solid colours are well suited to the lace knitting and the colours match the feminine feel (I’m sure there are a few men who would like lacy beaded socks but if any type of sock pattern is primarily female, that would be it). One pattern uses a typical Wool/Nylon sock mix, but the others are either MCN or Merino/Silk. While these yarns would not be recommended for socks that would be worn in work boots or to hike through a rain storm, for the eponymous lazing around they should stand up fine and feel wonderful on your feet. The socks probably shouldn’t be machine washed though, with the delicate yarn and beads. Jane includes tips on choosing yarn and beads to help you get good results. My favourite was the No Mind To Worry Socks and I decided to cast these on last Autumn. I used WooSheeps Doug in Serendipity and Debbie Abrahams size 6 beads in colour 606, both of which I bought at Fibre East in July. The colours work very well together, I love the complex blue/grey of the beads. I had knitted with beads once before, but it was quite some time ago and I appreciated that a guide to using beads was included in the book. I used the crochet hook method to place the beads, and while using a 0.6mm crochet hook sounds terrifying it wasn’t too bad apart from when it poked holes in my project bag. The beads are only placed every four rounds and only four beads at a time, which is quite manageable. It bothered me slightly that the pattern wasn’t completely symmetrical on the foot, but that’s probably just me. Also, be aware that there is a minor errata for the chart. I’ve only made one sock so far. As much as I enjoyed beaded knitting, I wanted a break (especially as I got distracted by my own designs). I’m looking forward to getting back to it some day when I’m in the mood to create something pretty and just go with the flow. I really like Lazy Sunday Socks. The patterns are well thought out and Jane has included some good tips. The photography is beautiful, as are the socks. The book is even the perfect size to fit in my project bag. If you want to give beaded knitting a try I would recommend this book.